The PRO C1 Charger is a simple single bay charger designed by Efest. It is a simple and easy to use device and uses a Micro USB to charge. There's a LED indicator light that goes from red to green when the battery is fully charged. 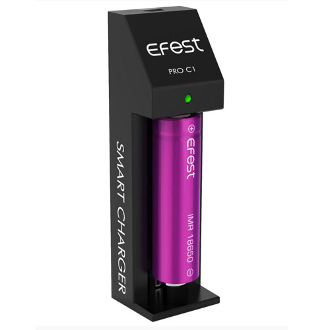 The Efest PRO C1 Charger can charge many types of lithium batteries even ones for electronic cigarettes, flashlights, electric tools, etc.